P = factor dealing with eccentricity; recommended value 1.15 VEd = applied shear force U = control perimeter under consideration. P, VEd, d as before u1 = control perimeter under consideration. Column C2 is taken to be an internal column. In the case of a penultimate column, an additional elastic reaction factor should have been considered. twt At the perimeter of the column, vRd max assumes the strut angle is 45°, i.e, that cot 6 = 1.0. Where cot 6= < 1.0, vRdmax is available from Concise EC2 Table 15.7. Rd,c ttttt The values used here for px, ply ignore the fact that the reinforcement is concentrated over the support. Considering the concentration would have given a higher value of VRdc at the expense of further calculation to determine px, py at 3d from the side of the column. Clause 6.4.5 provides Expression (6.52), which by substituting vEd for vRdc, allows calculation of the area of required shear reinforcement, Asw, for the basic control perimeter, u,. 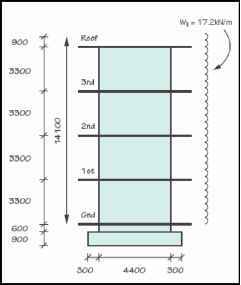 This should be considered as the required density of shear reinforcement. The sssss „ ^ for various values of d and pl is available from Concise EC2[ ] Table 15.6.